Meanwhile, a little further down the road, some crusty punks are collecting spare change so they can keep the touts in business. Say what you will about these funk Metal bands, they certainly pack a crowd In. Tonight sees the Atom Seed unleashed at last onto a big stage, and singer Paul Cunningham is cavorting around like a madman. Soundwise they have improved considerably since I saw them last, but the lighting guy does them no favours; for much of the set the Atom Seed are no more than enthusiastic silhouettes. Finishing with ‘Doghouse’, the Seeds receive a warm response but no encore. Until this evening I was a Red Hot virgin. Somehow I’d never been in the right place at the right time to observe this unruly spectacle. 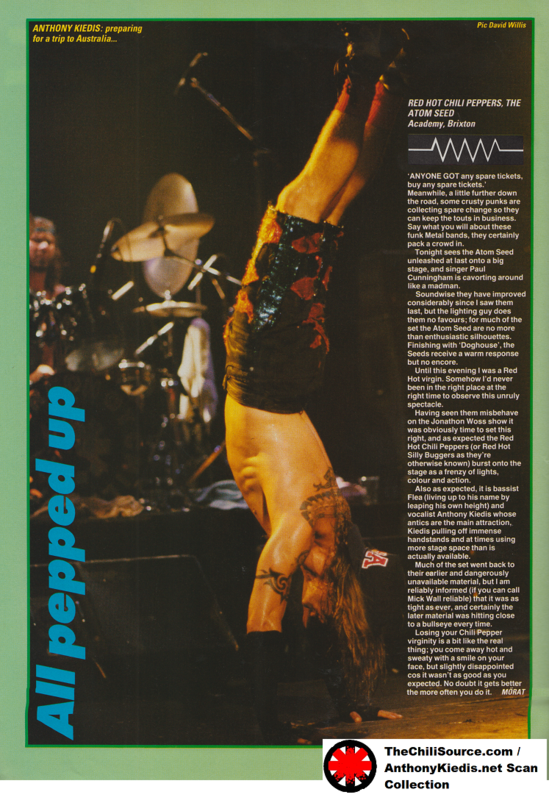 Having seen them misbehave on the Jonathon Woss show it was obviously time to set this right, and as expected the Red Hot Chili Peppers (or Red Hot Silly Buggers as they’re otherwise known) burst onto the stage as a frenzy of lights, colour and action. 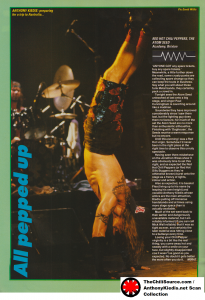 Also as expected, it is bassist Flea (living up to his name by leaping his own height) and vocalist Anthony Kiedis whose antics are the main attraction, Kiedis pulling off immense handstands and at times using more stage space than is actually available. Much of the set went back to their earlier and dangerously unavailable material, but I am reliably informed (if you can call Mick Wall reliable) that it was as tight as ever, and certainly the later material was hitting close to a bullseye every time. Losing your Chili Pepper virginity is a bit like the real thing; you come away hot and sweaty with a smile on your face, but slightly disappointed cos it wasn’t as good as you expected. No doubt It gets better the more often you do it.